I always took Rick as the foil to Carol’s less empathetic form of leadership. It made logical sense, as she was the only other person who produced any discernible leadership qualities to date. 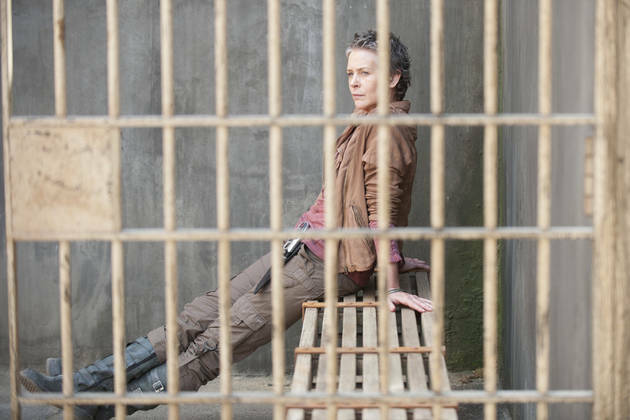 However, after the events of “Internment” I’ve finally realized that it is in fact Hershel – who is the yin to Carol’s yang – a leader who focuses on hope and individuality, rather than the good of many. It also helps he’s pretty badass too. “Internment” is indeed Hershel’s show, and he holds his own very well. His insistence at keeping up morale (his “sad soul kills faster than any germ” line was a standout moment) even when everything looks at its worst is an incredibly noble moment. Living at the end of the world must be an incredibly heavy burden to bear, and less reminders of what is actually happening can serve to help rather than hinder. It is in direct contradiction to how the lack of security failed the survivors early on in the season, but it does appear that the writers are siding with Hershel this time around, in the mere fact that his deeds were rewarded with not everybody dying. That’s not to say that he hasn’t come out unscathed – this is a man who once believed that the zombies could be saved of course, so his hesitance when forced to kill one of his patients felt natural. Also equally powerful was his speech to Rick about God’s plan, even when confronted by Caleb’s reminder that he can’t save them all, he feels this is all still a test of faith. Scott Wilson handles this all fantastically, his confident and kind manner undercut by a subtle sadness at how much work he still has to do. Action was surprisingly prevalent for an episode based around Hershel, as we were treated to two large climactic set pieces. Rick and Carl’s fight was fairly par for the course as far as zombie mow downs go, but Hershel’s escalating action with only a handful of zombies was fantastic. Tension kept on mounting, as disaster after disaster compounded into a frantic attempt at saving anyone they could. This is punctuated by the final scene of Hershel breaking down in his own cell, acting like a father who has been strong for the people he loves, and when he is finally alone gives himself time to mourn. It was all a fantastic scenario and highlighted how, as Daryl put it, Hershel is one “tough sumbitch”. Rick’s story was much more subdued this week, if you can call putting down a herd of zombies with automatic weapons subdued. It’s a culmination of Carol’s insistence that Rick can’t just forget the end of the world is happening, as he slowly is beginning to fall back into a position of power. As he calls his son to help kill the horde, there’s the realisation that he can’t protect his son from violence like a normal civilized society can. What he can do is remind him of those values, and the shot of the peapod juxtaposed with his pistol is a realisation of that line of thought. One last thing that I usually leave relegated to the observations at the end of the review, is the moments where the audience is forced to suspend their disbelief, and this happens fairly regularly. It has become a bit of a joke how many dumb decisions these survivors have made. Simple things like the sick only being locked in their cell much later than they should have been, or the lack of more protection from the horde beyond a fairly poor fence line are all things that are set up to manufacture these climatic events. There isn’t any inherent problems with the events themselves – they are often exciting and well produced – it’s the journey to get there that needs to be addressed. A show shouldn’t have to force the viewer to sit down and rationalise the steps these people take, and that has been tiresome for quite some time. Despite this problem, “Interment” really highlighted how society hasn’t failed yet, and that good things can still happen to very good people. It did border on very grim at some points, but in the end it does still leave hope for these people at the prison. Speaking of dying, I’m going to make a prediction here so I’m going to slap on a minor spoiler warning. I have watched enough television to know that once a character realises their purpose or fulfills that purpose, is usually when they depart the show. Hershel has had his biggest characterisation yet, and I have a feeling the next time we have an episode focused on the man is when we will lose him. The whole “leave me and my son alone” schtick wasn’t suspicious at all Papa Redshirt. Not at all.